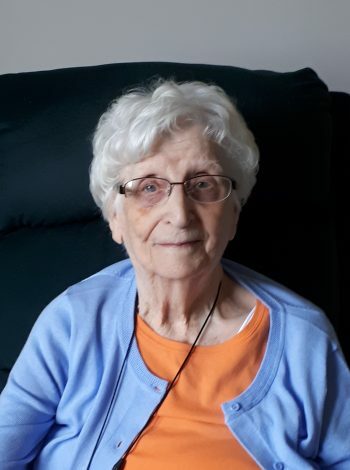 Passed away peacefully with family by her side at Admiral’s Coast Retirement Centre at the age of 95. Predeceased by her husband Hubert (1984). Leaving to mourn with loving memories; son Clyde (daughter-in-law Phyllis); daughters Grace (son-in-law Robert Clarke); Marjorie (son-in-law Gordon Chalker); grandchildren: Tracey (Treavor), Jennifer (Wayne), Christopher (Amber) Jeffrey (Shannon): great grandchildren, Joshua, Rian, Riley, Madi, Claire and Evan: other relatives and lifelong friends. Heartfelt thank you to Admiral’s Coast Retirement Centre for their care, compassion and support. Cremation has taken place. Visitation will be held at Carnell’s Funeral Home, 329 Freshwater Road, St. John’s, on Wednesday, November 28 from 2-4pm and 7-9pm. Funeral service will be held from Carnell’s Memorial Chapel on Thursday, November 29 at 2pm. Interment to follow at Mount Pleasant Cemetery. In lieu of flowers, contributions may be made to the Heart and Stroke Foundation or the Canadian Cancer Society. Interment to follow at Mount Pleasant Cemetery. Oh Miss Daisy, may the Angel’s give you the quickest bath, make the best bowl of soup, and never let you tell them their work is more important than time spent with you. I will miss our trips up the hall, chats and laughs. But most of all the gentle, kind and soft spoken lady that you were. Rest in Peace Miss Daisy, XO. Dear Phyllis and Clyde, Marjorie and Gord, Grace and Bob, We are very saddened To learn of Daisy’s passing. Our thoughts are with you as you deal with the loss of a cherished Mother, Grandmother, and Great Grandmother. It is wonderful that Chris, Jeff, and Tracey all made it home to spend some special time with Daisy., time that surely touched her heart.. May you all find strength and comfort in knowing she had a wonderful life and the most caring supportive family one could ever hope to have. Rest in peace dear Daisy. Sorry for the loss of your Mom.. Deepest sympathy and Condolences to you and your family . Sorry to hear of Daisy’s passing!To Clyde ,Grace Marjorie and families we extend our deepest sympathy and condolences! How our family loved Daisy’s visits. We would all sit and listen to her many stories of years gone by with rapt attention. Daisy was a very kind and gentle lady, always showing concern for others. She was always very special to us, especially to Jim. Her passing has left a void in our lives. Deepest sympathy to Marjorie, Grace, amd Clyde and all of Daisy’s family. So sorry to hear of Aunt Daisy’s passing, take comfort knowing that she is at peace. We won’t be able to attend the services as we are away until the 30th. You are all in our thoughts .